I’ll admit I had a head start. I enjoyed preview rides on both MAX and Streetcar. During yesterday’s opening festivities, I had the chance to cross both on MAX and on foot. And today I cycled east across our wonderful new bridge, and then made the return journey with my bike on the front of a #9 TriMet bus, completing the cycle of all the modes allowed! Tomorrow the Orange Line opens. TriMet will be free for the day, and to tell you the truth, I don’t remember this much pomp and circumstance for the Green or Yellow lines. (The Red Line opening festivities, of course, were cancelled by 9/11). $4 for 22oz at the grocery store; no all-day option $2.50 for 2 1/2 hours, $5 all day. American beer has caught up to Germany in quality American public transportation, sadly, has not. Our good friends over at Bike Portland are celebrating their tenth birthday. The Metro Policy Advisory Committee (MPAC) is supporting the proposal to not expand the UGB in 2015, albeit in a split decision. In somewhat related news (I say somewhat as new suburban single-family home construction is not a substitute for urban apartment buildings), the Portland Mercury reports that mass no-cause evictions (wherein a landlord evicts all the tenants in a lower-income building; does some remodeling, and then remarkets the premises to a higher-income clientele) are on the rise. And The Oregonian notes that Ballot Measure 47/50, which reset property tax assessments back to 1996 levels (including for new developments) has a disparate impact on the poor–as residential real estate in gentrified areas is effectively taxed well below its market value. While Portland continues to ponder bike share, The Transport Politic takes a look at the system being built in LA, which has several novel and important attributes: It is run by the transit agency (Metro), not by a municipal public works department; and it focuses on the job of last-mile service–many bikeshares are located at transit centers, and your transit ticket lets you “transfer” to bike and vice versa. A 2012 map of possible bike-share station locations. Note that this isn’t the current plan, though the service area currently proposed is very similar to the one marked here in orange. Bike sharing service areas are problematic in exactly the same way that public transit service areas are problematic. 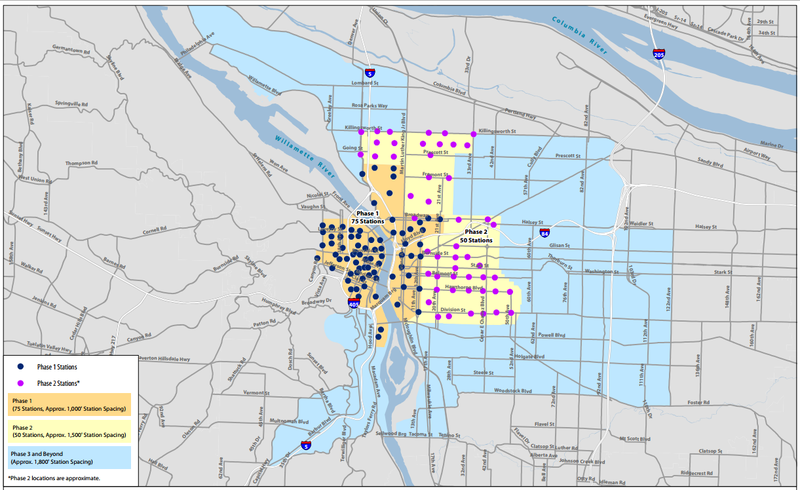 With Portland preparing next week to finally approve a bike sharing system, this problem is back on the city’s mind. It should be. The most important problem in Portland right now is housing affordability, and this is inherently linked to geographically specific services like bike sharing. I’ve been thinking a lot about this and won’t pretend to have all the answers. But I feel like two big ideas are missing from a lot of Portlanders’ conversations about this. Here they are. Metro has an 8-part, in depth profile of 82nd and Division, looking at the past, present and future of the intersection. Well worth a read. Tori and Alon talk with Ray Thomas, the dean of Oregon cycling lawyers about the current state and evolution of bicycle law in the state. In the second half they are jointed by Christopher Stanton, developer of C3FT, the first device to detect vehicle passing distance, and Officer Robert Simmons of Chattanooga, one of the first law enforcement officials to use the device.